The view from here: One of these days . . . I am going to have to cut back or stop doing dumb things. I made a run to Jasper, Alberta and back last weekend. About a week ago the weather was supposed to be relatively nice. That changed with the arrival of a snowfall warning and a severe drop in the temperature. I decided to go anyway. I have new winter tires on the car and my weekend schedule was clear. I really did not care where I ended up for the weekend. 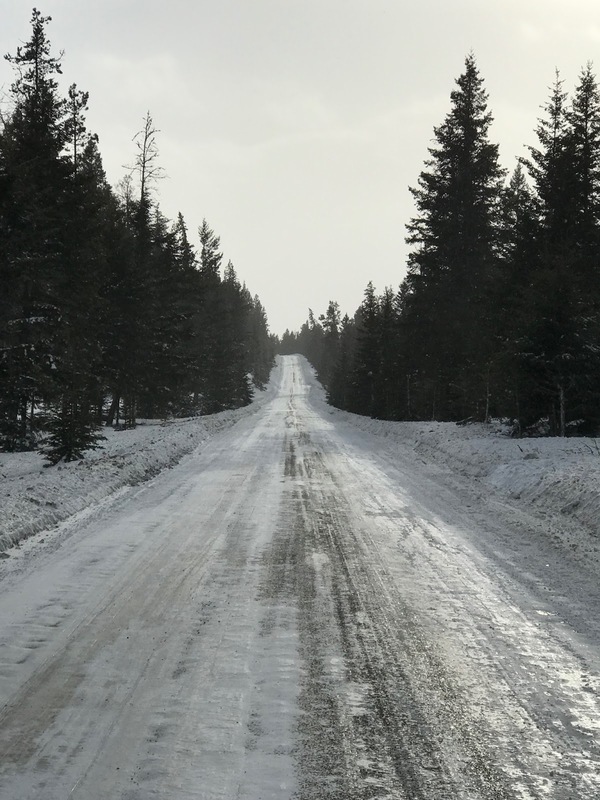 I began by heading to Drayton Valley, Alberta which was just starting out on my way to Jasper and it was snowing heavily and near whiteout conditions. I got to town, stopped to snag a large coffee and the snow was beginning to break. Taking this as a sign I went for it. I need to get better at not taking events as a sign of something. Between Edson and Hinton, Alberta I saw two vehicles in two different locations off the highway on their roof. Another spot I saw a vehicle off the road in the snow and a jack-knifed semi off the road. On the highway between the entrance of Jasper National Park to Jasper itself I saw a semi truck in the ditch and further on a gravel truck that managed to do the same. The highway was fine until I got somewhat close to my destination. It was partially covered with snow and ice. It was slick in places. Jasper itself got whacked with at least a foot of snow, likely more. Hard to tell since it drifted due to the wind. The town was starting to get plowed. I was hoping I would not get stuck finding a place to park as the street where I was staying had not been cleared yet. You could see ruts in the snow where people had been driving. My hotel was very comfy and quiet. Not too many people get rowdy in those temperatures. Taking photos was not on the agenda. It was too cold. When I got up the next morning the temperature with the wind chill was reportedly -41C. I fully expected my 2012 Kia Rondo would not start. Especially since I did not plug it in during the night. One turn of the key and it started. I might have to reward the Kia in the spring with a wax job or something. Some guy with a new Dodge 4x4 pickup had to get a boost. The trip back was worse than the trip out. It was colder with extreme wind. For the first forty miles the wind was strong enough to move the car on the highway. It was very icy with blowing snow and I was driving significantly less than the speed limit due to road conditions. It was cold enough I was slightly concerned the fuel lines might freeze up while I was driving. I have had that happen once years ago. I made it back without incident. Keep warm. It is cold out there. 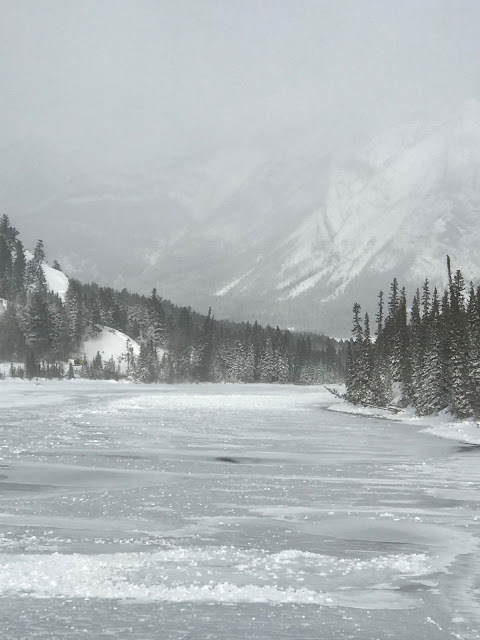 Very cold Athabasca River near the Jasper Park Lodge. Sometimes it just isn't worth it to make the trip. Glad you made it there and back safely. I really should have skipped the trip. Yeah, when I read your earlier post saying you were going on that road trip, I wondered whether that was a good idea. But I was trying not to be a Judgy McJudge so I didn't say anything. I'm glad your car started; that was a bit of a miracle if it wasn't plugged in. I trust you have a winter survival kit in the car "just in case." Some say 'dumb things.' Others say 'adventure.' Glad you made it home in one piece! That kind of cold is hard on the engine, not as hard when it's been plugged in. Not sure the car has a block heater. You are right about the cold being hard on vehicles.